Ahh San Francisco…wow. This was one of the first stops I had on my virgin tours with the SCI gang. After a huge drive from Telluride in “Jean Claude Band Van” (the first of Cheese vehicles), we stayed right on the Bay at a friend’s condo. I woke up to a gorgeous view of boats and water. In Fact, it was that morning, when Kang and I were out on a Boston wailer trolling around , that he popped the question, “would you consider joining us full time?” I loved the idea, but was a bit booked up with other projects. What was I thinking! But eventually I cleared my schedule (like for the next 25 years). 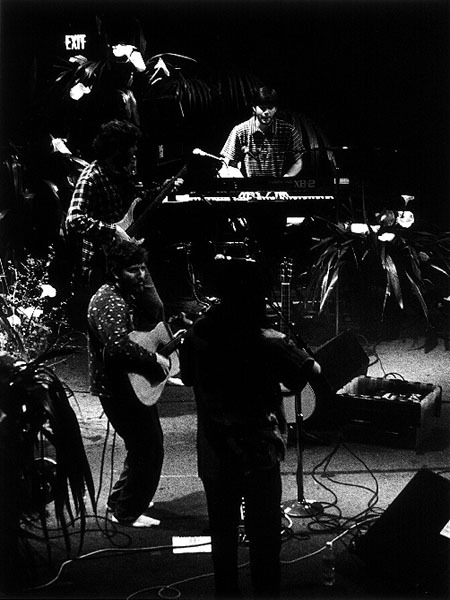 The String Cheese Incident – Fillmore – San Francisco 1998 (photo by Scott Chernis). I think it was on that run that we hit Great American Music Hall. It was an amazing venue with its gold leaf balconies and classic ambiance. Then later we played the Fillmore. I remember kind of flipping out to see the “Jerry” room in the backstage area at The Warfield. So much great music had come through these places. It was an honor to be on those stages. The Bay Area was always receptive to SCI. And it will be awesome to be back in this room again, like coming home.